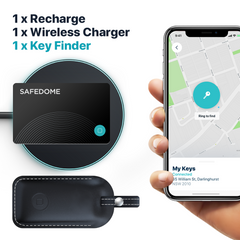 Safedome connects to your iOS or Android phone via Bluetooth and alerts you if your wallet's at risk. Unlike simple tracking apps and devices, Safedome is active. It knows your item is missing before you do, and makes sure you're alerted quickly. The superslim card fits easily into anything you can't afford to lose. 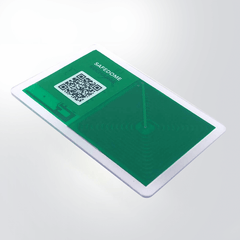 Keep Safedome in your wallet, purse, handbag or passport. Connected to the app you'll always know the location of your items if they ever go missing. You can customise the alerts to suit your needs; control how quickly you get alerts, choose the sound you prefer and select the places you don't want to be alerted, like home or work. Safedome Recharge can last up to 3 months on a single charge. The included wireless charger is compatible with all Qi-ready smartphones and devices.